Every year, Americans create 258 million tons of trash and more than half, 65.5% of that or 169 million tons end up in landfills and incinerators. Did you also know that about 45% of the world’s plastics set for recycling have been exported to China since 1992? As of January 2018, China has stopped allowing recyclable goods to be imported. This includes waste from the US. This is concerning to the United States because we have been dependent on exporting waste for over two decades. Recycling is a way that we can take matters into our own hands and help decrease the amount of waste that the US produces altogether. 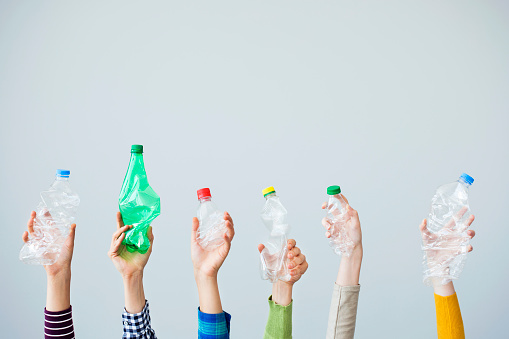 Recycling reduces the amount of waste that is sent to landfills, conserves natural resources, prevents pollution, and creates jobs in the waste industries. Recycling is something everyone can do to help reduce their carbon footprint. It is a simple task, yet prevalent on the day-to-day. HCP realized it was our social responsibility to do so; if we can help reduce our carbon footprint, we encourage you as well! Educate yourself on recycling: what items can be recycled, what to do with items you are unsure of, where you can get information, etc. When you go shopping, bring your own reusable bag to help encourage the reduction of plastic! Replace store-bought water with a water filter system and reusable cups or water bottle! When printing: with drafts print on recycled paper, limit printing volume, and try printing double-sided! If you can reuse or repurpose an item, give it a try! Make sure you get rid of batteries and other electronics properly—you could even donate old computers to a school, camp, or organization. Talk with your trash provider, building manager, or home owner’s association to see if a recycling service is provided or can be introduced. If worst comes to worst, designate a bin and communicate what recycled goods can be collected with your team or family members. If you are using this approach, you will want to look up local drop-off points. Spread the word! Encourage your peers! Tell others how easy it is to make a difference. If you are still not sure where to start, visit your local municipality’s website, waste management company, or the US Environmental Protection Agency’s website to see how you can get information on recycling. The non-profit, Recycle Across America (RAA) has created an extensive tool-kit and compiled tips for additional guidance!